Published in the The Times of India, 6-October-2014. An article in Gujarat Samachar has also appeared recently regarding my initial work on the Haribhakti Collection. 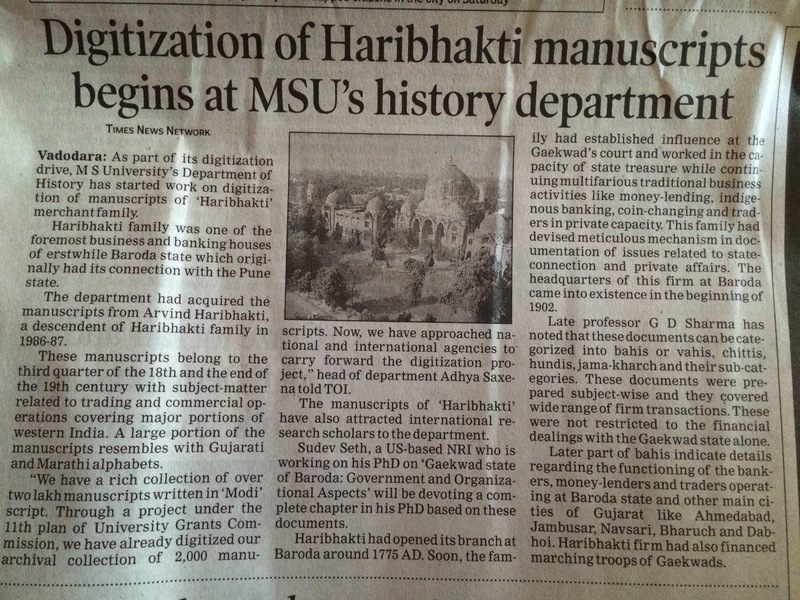 With the support of the Department of South Asia Studies and the Center for the Advanced Study of India at the University of Pennsylvania, I pursued 10 weeks of pre-dissertation fieldwork at the MS University archives in Baroda and the National Archives in New Delhi during the summer of 2014. I also spent 1 week in London surveying the India Office Records at the British Library. My dissertation research is about statecraft and governance in eighteenth and nineteenth-century western India with a focus on the political relationships and cultural practices of credit networks. In particular, I am investigating how a band of military mercenaries called the Gaekwads came to rely on capital from independent banking family-firms to build institutions and consolidate public authority in Gujarat. You can read about some of the work I did this summer here. My work is based primarily on rare archival materials housed at the Prof. S.C. Mishra Archives and Library Cell at the Maharaja Sayajirao University of Baroda (Gujarat). The primary sources I am studying are part of the Haribhakti Collection and were donated by Mr. Arvind Haribhakti between 1983 and 1987. Hari and Bhakti were two brothers who founded the powerful ‘Haribhakti’ banking family-firm in the late-eighteenth century in western India. The firm was initially based in Pune but moved to Baroda at the insistence of the early Gaekwad regime. Descendants of Hari and Bhakti continued the family business of money lending to the state and cultivators, resolving local disputes, and honoring promissory notes (bills of exchange called hundi) from other bankers across the country. I am unaware of any scholarly work in the field of South Asian studies that is based on the private papers of a prominent banking family firm and I am excited by the possibilities of writing a social history of merchant economies and the household, regional state formation in early modern India, and the dynamics at play during the important transition from Mughal rule to British imperialism. This entry was posted in History, University of Pennsylvania and tagged Center for the Advanced Study of India, India Office Records, Maharaja Sayajirao University of Baroda, National Archives, University of Pennsylvania by Sudev J Sheth. Bookmark the permalink.